July 22, 2010 – Joe Sutter, legendary Boeing aeronautical engineer credited with leading the development of the iconic 747 jetliner, won the inaugural Flightglobal Lifetime Achievement Award, Flight International magazine announced at the 2010 Farnborough International Airshow. The Farnborough International Airshow is a seven-day international trade fair for the aerospace business which is held biennially in Hampshire, England. The airshow is organized by Farnborough International Limited, a wholly owned subsidiary of British aerospace industry's body A|D|S (formerly the Society of British Aerospace Companies or SBAC) to demonstrate both civilian and military aircraft to potential customers and investors. Along with the Paris Air Show is an important event for the aerospace industry particularly for the announcement of new developments and orders. "Joe Sutter helped shrink our planet for tens of millions of ordinary travelers," said Murdo Morrison, editor of Flight International. "More than 40 years on, the Boeing 747 remains a unique and radical design – unmistakable and beautiful, but most importantly, a highly efficient people and cargo mover." 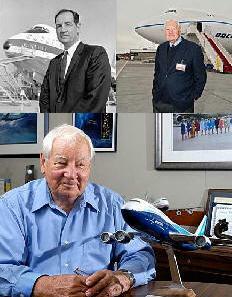 Sutter joined Boeing in 1946 as an aerodynamics specialist and worked on the Boeing 377, Dash-80, 707, 727 and 737. In 1965, he took on the role of chief project engineer of the new 747 program, which pioneered the twin-aisle widebody concept. He subsequently contributed to other Boeing jetliner development as well. "The best airplane is merely the expression of human thinking and dreaming," said Sutter. "People are always the story, and I've been truly fortunate to know and work with countless individuals whose creativity, energy and vision have helped create the ultra-reliable commercial airplanes and systems the world relies on today." Sutter is still contributing his engineering expertise to Boeing. He serves on the Senior Advisory Group, a panel of former company executives that provides insight and guidance to current Boeing Commercial Airplanes leaders on product strategy and development. "Joe Sutter was and remains a significant figure in the history of our industry," said Boeing Commercial Airplanes President and CEO Jim Albaugh. "He played a vital role in configuring several of our key programs, in addition to his leadership of the 747 program. Everyone at Boeing Commercial Airplanes and in commercial aviation owes him a great debt." Since the revolutionary 747 entered service in 1970, more than 1,400 of the big jetliners have been delivered. Many of them still crisscross oceans, transporting millions every year. The 747-8, the latest version of the jumbo jet, is now in flight testing. The Flightglobal Achievement Awards honor the most-admired individuals in aviation and aerospace. Readers of flightglobal nominate and vote for winners every year.